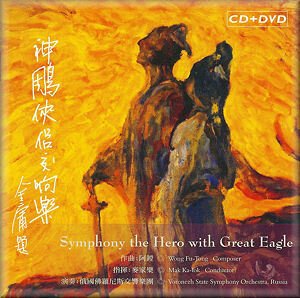 This release contains probably the only symphony ever written to have been based on a kung fu novel! Fu-Tong Wong is a Cantonese composer currently living in Taiwan. Initially self-taught, he emigrated to New York in the 1970s to help in his brother's noodle business, but was able to take a university degree in music from 1975. Since then he has published books on music theory and violin practice, taught and studied further, and written a fair amount of music, although even as late as 1990 he was still working in his brother's concern. This CD, on Wong's own label, was originally released in 2004, and then again in 2009 on a disc paired with a recording of Wong's Symphonic Poem of Shiau Feng. As the list suggests, each movement has a distinctive character, both formally and programmatically, but there is a pervasive mood of optimism throughout the work, with the exception of the Adagio, which is a beautiful elegy for strings. Surprisingly perhaps, the symphony has a very Western, at times almost neo-Classical feel - the light-handed orchestration is inventive without recourse to exotic instruments. It is not until the seventh movement that the music takes an obviously Chinese turn, when the galaxy of heroes turns up, as it were, but even here, the impression - agreeable, nonetheless - is of a Western composer adding ethnic colour. The pick of the movements besides the Adagio are the Variations, epic in character, and the high-seas drama of the Rondo, but in truth there is not a dull moment for the listener, who is swept along with the flow of Wong's lovely music, which culminates in the lush final Fantasy. There is a definite film score quality about the work in places, particularly the Prelude and Rondo. This is quite apposite, given that Jin Yong's story has been adapted on no less than ten occasions for both big and small screen in the Far East. The unremitting succession of seamlessly incorporated melodic ideas, narrative interest and timbral imagination brings to mind the scores of Malcolm Arnold or William Alwyn, or, from an earlier age, Rimsky-Korsakov. Sound quality is good, although there is a slight lack of definition to the strings in tutti sections - most noticeable in the strings-only Adagio movement. The Voronezh State Symphony Orchestra, despite its low profile, is one of Russia's oldest, with an impressive history of associations. It performs Wong's music capably and respectfully, and is well guided by Mak Ka-lok. The CD booklet is informative - but only for those who read Chinese! The English-language notes are restricted to two or three paragraphs, but yield just about enough information to satisfy. The CD comes with a bonus DVD, although its attraction is mitigated by the fact that it is in Chinese only. Nevertheless, it does offer the opportunity to see the orchestra rehearsing and later playing some of this symphony, and a happy-looking Wong in interview.